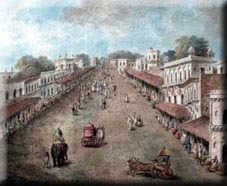 Located on the Grand Trunk Road and Grand Trunk Canal and laying beside the river Ganges, Cawnpore was to become a vitally important garrison town, straddling key communication lines. It lay on the approaches to the Punjab, Sind and the newly acquired Oudh provinces. Unfortunately, these new conquests had denuded the encampment of many of its European soldiers. It was thought that they were needed to help pacify the newly acquired areas. General Wheeler was the commandant of the camp and his fine military record gave the Europeans in the area a reason to feel confident that the mutiny might pass them by. Other than the East India Officers, the European contingent was a strange collection of military families, business owners, barbers, operators of toll roads, telegraphs and railway engineers. There was one complicating factor in the area that would come back to haunt Wheeler and the garrison. Nana Sahib was the adopted heir of the last great Mahratta king Baji Rao. Unfortunately for Nana Sahib, the East India Company decided that Baji Rao's pension and honours would die with him and would not be passed on to any successors. Nana Sahib lobbied hard sending an envoy, Azimullah Khan, to London to petition the Queen directly but to no avail. This dispossessed Hindu aristocrat would play a dangerous double game before deciding who to support in the mutiny. There had been problems and difficulties at Barrackpore and Berhampore back in February and March of 1857. But it was to be the events of May 10th in Meerut that converted the small but mostly contained disturbances into a full blown mutiny. On May 9th, eighty-five Cavalry sowars of the 3rd Bengal Cavalry refused to use the newly issued cartridges despite claims that no defiling fat had been used in their manufacture. The eighty-five were found guilty and sentenced to life imprisonment. They were shackled and led to jail. This was too much for many of their comrades. 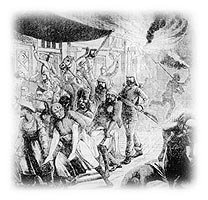 In the heat of the following day, Sunday 10th May, a group of Sowars descended on the town and released their comrades. When some British officers tried to intervene, they were cut down or shot. Bungalows were set alight and any Europeans were considered fair game. About fifty European men, women and children lay dead by the end of the day. With no obvious command centre or structure for the mutineers in Meerut, most of the rebellious sowars and sepoys headed for Delhi which was only 40 miles distance away. There they headed for the old Moghul Emperor and asked him to lead their rebellion and to restore the Mughal Empire so that Hindus and Muslims could live together in peace and combine forces to evict the Christian Company from India forever. The old emperor was unusually decisive in granting his patronage to the mutiny. This turned a localised army mutiny into a more significant political challenge to the rule of the East India Company. The slow response by the commander of the East India Company General Anson did not help. He underestimated the size and escalation of the challenge to the company's authority. He would not be the only one to make that mistake in 1857. The mutiny spread from Meerut and Delhi to Agra, Muttra, Lucknow and Bhurtpore throughout the month of May. However, Cawnpore appeared to remain loyal. British officers dutifully slept amongst their sepoys and sowars in order to show their confidence in their men. In fact, General Wheeler was so confident, that when a relieving force of two companies of the 84th arrived on June 2nd, he sent one of these companies plus one of the already arrived 32nd on to the besieged Lucknow. Not realising how useful they would have become to the defence of Cawnpore in the days ahead. 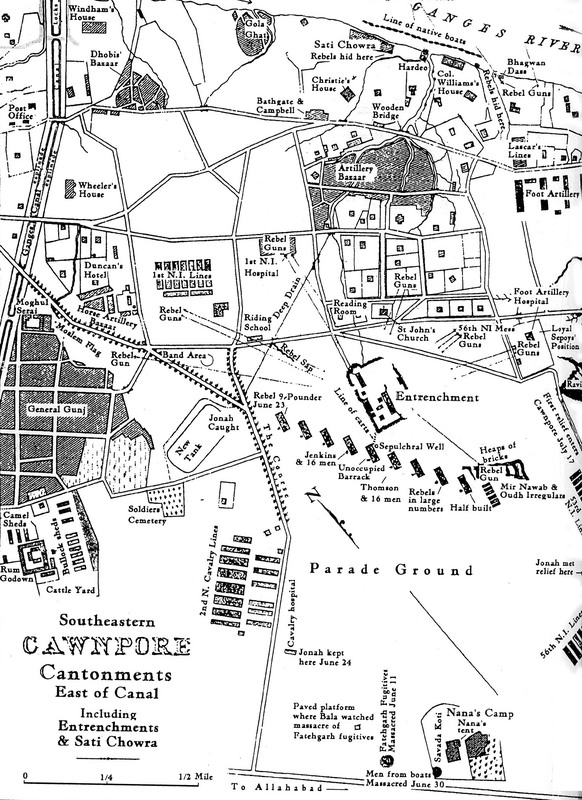 The obvious defensive location in Cawnpore was the magazine located in the North of the city. This had thick walls, plenty of ammunition, stores and it contained the local treasury. It was ready to defend. Unfortunately, Wheeler was expecting reinforcements to come from the South and he did not want them to have to fight their way through the city to relieve them at the magazine. He also felt that even if the Indian troops did mutiny, they would probably loot a little and then head North to Delhi as most other mutineers had done. Therefore he did not expect to need to withstand a long siege. Conveniently, there was already a military building site to the South of the city. Nine barracks were being constructed at the Dragoon barracks. It was already full of building materials and coolies. He hoped that to redirect their construction towards an entrenchment might not unneccesarily alarm the Indian troops in the station. This would at least create a defensible area for the Europeans whilst any looting might take place before the mutineers would flee towards Delhi. As this was the height of the hot season, digging trenches proved particularly difficult. It was almost impossible to get the trenches below waist height. There were also a large number of buildings overlooking the entrenchment that would provide cover for any would be attackers and allow them to shoot down on any defenders. The biggest problem was the lack of decent sanitatary facilities. There was only one well and that would be exposed to enemy fire. The entrenchment would be fine to defend with a significant force of soldiers or for a very short period of time. As it was, there would be a thousand plus civilians with a pitifully small garrison of European soldiers who would end up having to defend for far longer than they had possibly anticipated. In a large cantonment with a thousand plus nervous and worried Europeans it was always going to be difficult to keep preparations for a defence against their own soldiers extremely difficult. As stories of various atrocities of women and children filtered back to Cawnpore, the city became understandably on edge. Although no direct threat had yet occurred in Cawnpore, European families began to drift into the entrenchment and tried to find a space in one of the sturdier buildings available. The very sight of the Europeans withrawing into relative safety was not unnoticed by the Indian sepoys and sowars. 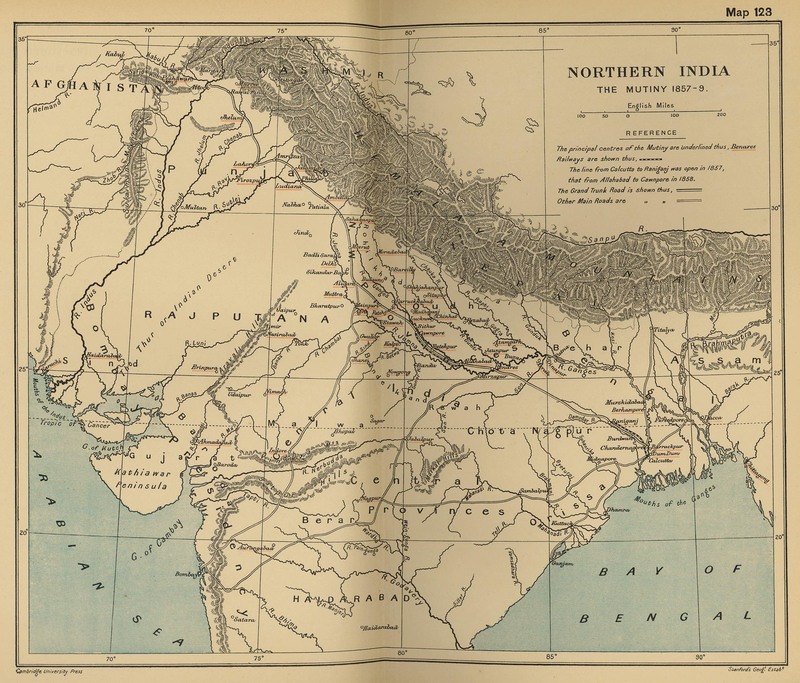 To try and disperse the number of Indian soldiers away from Cawnpore, General Wheeler decided to send troops on various 'missions' to relieve garrisons in the region. One such mission was to send the surly 2nd Oudh Irregulars to Fatehgarh under the commad of Fletcher Hayes and Lieutenant Barbour. On the road to Fatehgarh they bumped into two more Englishmen named Fayrer and Carey. On the night of May 31st, Hayes and Carey left the other two Englishmen with the unit whilst they rode into a nearby town to confer with the local magistrate. The next morning they tried to rejoin the unit only to be met by an older native officer galloping towards them. He begged the two to flee. He explained that the unit had mutinied and that Fayrer had been decapitated and Barbour cut down as he tried to make his escape. As this was being explained, Sowars raced towards them. Carey and Hayes wheeled around and attempted to gallop to safety. Hayes did not have the equestrian skills of Carey and was soon cut down by the advancing sowars. Carey on the other hand galloped over hedges and walls to try and shake off as many as he could. His horse came to a halt with exhaustion four miles later. Thinking that he was done for, Carey was amazed to see the abandoned horse of Hayes which he mounted and escaped to safety. The cantonment was oblivious of this ominous turn of events and life seemed to continue if apprehensively. Meanwhile, Nana Sahib had declared his loyalty to the British and sent what volunteers he could spare to be at the disposal of Wheeler and for the defence of Cawnpore. He sent his units to camp just outside the magazine. 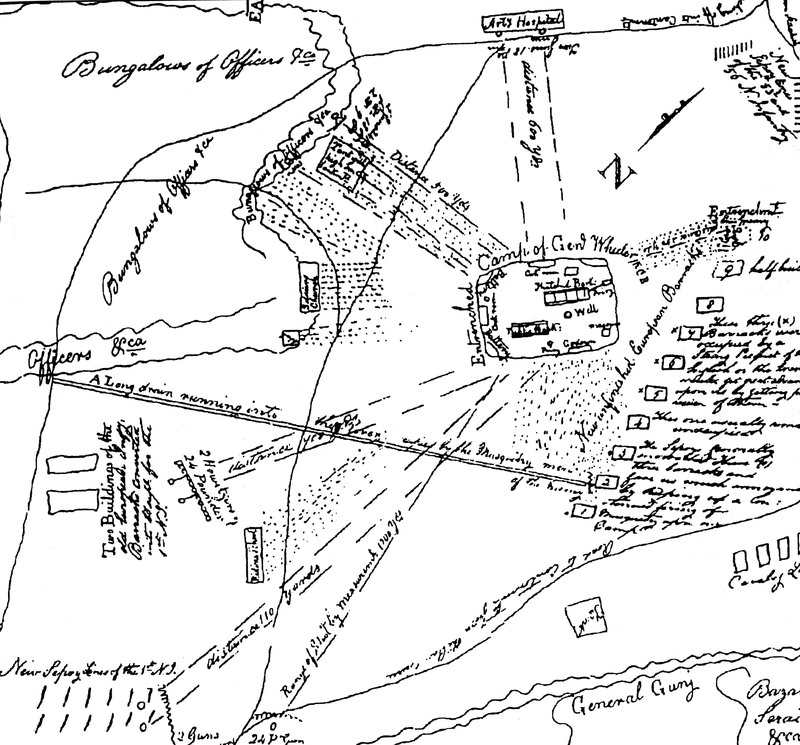 The forces at Wheeler's disposal were pitifully small. He had 49 soldiers of the 84th, 79 of the 32nd (mostly sick), 59 artillery men and 43 Eurasian drummers and fifers. Barely 250 in total. He had to defend a thousand odd civilians. Tensions would be raised on the night of June 2nd when a drunk Lieutenant Cox fired on his own guard. He missed, was disarmed and thrown into jail for the night. The following day the sowars were less than impressed when a hastily convened court failed to convict him of firing on his own troops. This seemed to confirm that there was one rule for the English and another for the Indians. Rumours of mutiny and impending treachery were becoming so widespread that it was difficult to tell the truth from the rumours. There were still Native regiments based in the city. The 1st, 53rd and 56th Native Infantry and the 2nd Bengal Cavalry. It was to be the 2nd Bengal Cavalry that were the prime instigators of the mutiny. It seemed to them as if the English were already prepared for them to mutiny. They cited the insulting fortification of the entrenchment, artillery guns being primed and aimed at them, the fact that they had to collect their pay out of uniform and one by one so as to not all turn up in the entrenchment armed and en masse, the acquittal of Lt Cox and rumours that they were to be summonsed to a parade where they were to be blown to pieces all convinced the sowars that something was seriously amiss. At 1:30am on June 5th, three pistol shots signalled the start of the mutiny. At least one Rissaldar-Major Bhowani Singh refused to join his comrades and was cut down there and then. As predicted by Wheeler the sowars began to burn buildings, loot and cause mayhem. The 53rd and 56th were groggily awoken by the panic and started to form up. The 56th began to panicand started to run off. European artillery opened up on the fleeing sepoys assuming they were mutineers too. If they hadn't been before, they were now. Worse than that, the 53rd, Wheelers old regiment, were caught up in the cross fire. The confusion and panic had led the British defenders to fire upon what was probably the most loyal unit in the area. Soon virtually the entire native contingent had risen up or run off. Again, as foreseen, after a night of looting and destruction, the sowars and sepoys seemed to be making off towards Delhi to seek further orders and instructions from the Mughal Emperor there. Although deeply disappointed by the mutiny, the British officers were relieved that they would not have to survive the ordeal of a siege. During the chaos, Nana Sahib and his contingent entered the magazine/treasury. The 53rd guarding the magazine were unsure of what was going on elsewhere in Cawnpore and had nominally remained loyal. At this time it was thought that Nana was volunteering to guard the magazine on behalf of the British. As it was, once they were on the inside he announced his loyalty to the mutiny and his desire to become a Hindu vassal of the Muslim Mughal Empire. After looting the treasury, Nana Sahib advanced up the Grand Trunk Road with his elephants and loot. He caught up with the bulk of the mutineers at Kalyanpur. He realised that if he wanted to resurrect the old Mahratta Confederacy then Cawnpore would need to be captured. He therefore pleaded with the mutineers to about-turn and come back with him to besiege and capture the city on behalf of the Mughal Emperor. Reluctant at first, the sepoys and sowars were convinced by the treasure he was carrying and a promise to double their pay and reward them with gold if they were to destroy the British encampment. Ominously for the British, the mutineers trundled back into town. This time, they made sure that they had expunged all the Europeans from outside of the entrenchment and systematically plundered and destroyed all European owned property. Native Christians were also singled out for gruesome fates. Whilst all this was happening Nana Sahib took the time to write a letter to General Wheeler informing him to expect an attack the next morning at 10am! The attack started half an hour late at 10:30 on June 6th. It would actually take the form of a prolonged artillery bombardment but this offered little comfort to the defenders who realised quickly that the mutineers had more and better guns available to them and that the entrenchment offered woefully inadequate cover from overlapping fire from all sides. It did not help the morale of the British to realise that the mutineers were putting their training to good account. The British artillery men fired back, but with smaller guns it was always going to be difficult. Additionally, the British had to keep their guns ready and primed with cannister in case of an infantry assault. Fortunately for the British, the mutineers were reluctant to test the defences in an all out assault. In fact, they had been led to believe (falsely) that the entrenchment had gunpowder filled trenches preceding them to explode if the mutineers got too close to the defences. The British defenders could give a sigh of relief, but they had been given a taste of what a miserable siege they were in for. The following days, and indeed weeks, would only confirm what a difficult position this was to defend. The fact that it was the hottest time of the year only added to the miseries of the defenders. The one well was exposed to the enemy artillerymen and snipers who took delight in aiming at the desperately thirsty defenders. Water extraction would have to take place at night to stand any chance of success. A second dried-up well would have to serve as the make-shift burial chamber. The solid ground was too difficult to dig individual graves. Dead bodies would have to be piled up outside the buildings awaiting nightfall when they would be dragged and dumped with as much ceremony as could be summonsed given the circumstances. Even with this one particular precaution, diseases such as Smallpox and Cholera broke out and would ravage the steadily weakening defenders. Over the first week of the siege the mutineers completed the encirclement. They created loopholes and firing positions from surrounding buildings. They probed the defences for weaknesses. Captain John Moore retaliated and kept the defenders on their toes by launching dangerous but successful night time sorties to disrupt the attackers or spike their guns. One consequence of these sorties was that it convinced Nana Sahib that he should retreat his HQ to Savada House some two miles away in relative safety lest he become a target himself. Provoked by these sorties, Nana Sahib attempted to lead a direct assault on the entrenchment. However a combination of lack of enthusiasm by the mutineers and some well timed artillery shot by the defenders dispersed the attack before it even began. So the pattern of artillery bombardment and sniper fire was resumed with some new heavier mortars adding to the misery of the defenders. It was calculated by Jonah Shepherd that one round was landing every eight seconds on average. On the 11th June, the mutineer artillery decided to change tactic by concentrating their fire on particular buildings and firing incendiary round shot. They had some success with some of the smaller barrack buildings. To increase their chances of success, they also sent greased natives to try to set fire to the buildings. The first assault of substance took place on the evening of June 12th. Musket fire was ferocious and the British had to use cannister extensively to even out the imbalance in personnel. The final charge never did come through. The mutineers were still genuinely convinced that the British had laid some sort of trap; gunpowder filled trench or something along those lines and did not want to be the first ones to discover it. The loss of the hospital to fire on the 13th June was a major blow to the defenders. It hurt their morale, but it also destroyed most of their medical supplies and removed one of the major structures from the defenders. As people scurried out of the hospital barrack for safety, the mutineers gathered for an attack. However, Lieutenant George Ashe used his few artillery pieces to devastating effect with well aimed cannister round after cannister round. The mutineers were convinced that there were more defenders than there actually were. The bombardment and sniper fire continued until the 23rd June. This was a date designated to host a major assault to coincide with the anniversary of Plassey. It had been foretold that the British would leave India on the 100th anniversary of this battle. Nana Sahib wished to take advantage of such a favourable omen. The 2nd Cavalry led the charge but they did so at the gallop. This left the horses winded in the final stretch over open ground. 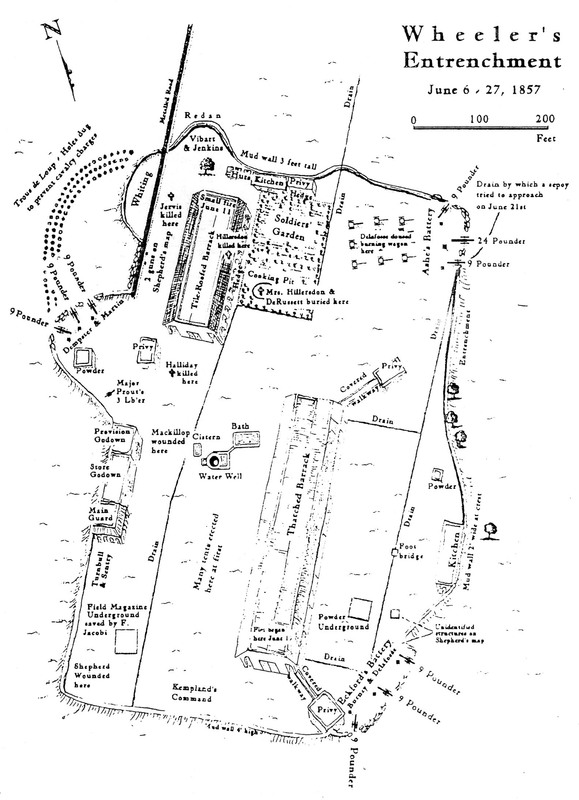 British discipline allowed the mutineers to approach to within 50 yards when all hell let loose. The British fire was so well directed and the cannister so devastating that the cavalry wheeled and fled before hitting home. The danger was not yet over as men of the 1st Native Infantry advanced behind cotton bales and mobile parapets. Again, fortune smiled on the British when their opening volley brought down the 1st's commanding officer Radhay Singh. Cannister blew away any cover that the infantrymen had hoped to gain from the cotton bales. Indeed many of them combusted and became an additional hazzard to the attackers. 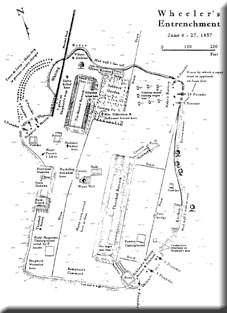 On the other side of the entrenchment by the barracks, mutineer numbers allowed them to overwhelm and engage the defenders in hand to hand combat. Lieutenant Thomson led 17 men to fight back and regain the position in desperate fashion. The defenders cannons were wheeled around to help clear this flank of mutineers. By midday, it was clear that this assault too had failed to gain entry into the entrenchment. Although it had come close and the defenders could ill afford to lose any of more men. Although the attackers were becoming frustrated at their lack of success, it did seem as if time was on their side, at least in the short to medium term. It was known that Havelock was advancing up from Allahabad, but he had become severely bogged down and would not arrive imminently. The defenders on the other hand were becoming increasingly desperate, their already small quantity of soldiers was being steadily whittled down by the combined attritional effects of successive bombardments, snipers, assaults, disease and poor to non-existent medical supplies. Food and water were dangerously low and the hot season was still beating down the sun unmercifully on the defenders. By the 21st of June, they had probably lost a third of their number. Personal tragedy had afflicted General Wheeler when his son Lieutenant Gordon Wheeler had been decapitated in the last assault on the barracks. His own personal morale was at its lowest ebb. With the prospect of relief seemingly as far away as ever, General Wheeler assented to Jonah Shepherd slipping out of the entrenchment in disguise to ascertain the condition of the mutineer army. Jonah was picked up pretty quickly by the mutineers although they failed to appreciate that he had been part of the defending force and merely imprisoned him as a wastrel. Whilst this was all taking place, Nana Sahib and his advisers had come up with a plan of their own to end the deadlock. They used a female European prisoner, Rose Greenway, to approach the entrenchment with the idea of initiating negotiations. She conveyed to the defenders a note that said that Nana Sahib was willing to offer safe passage to Allahabad for all those who lay down their arms. This offer was rejected by General Wheeler ostensibly because it hadn't been signed and that therefore no personal guarantee had been offered. However, the very fact that it had been made meant that the defenders began to debate the merits of holding out or capitulating and returning under the truce being offered. The following day, June 25th, a second note was brought, this time by a different female prisoner, a Mrs Jacobi. This letter was signed by Nana Sahib himself. Debate swirled amongst the survivors and it was clear that there were two camps forming: Those determined to hold out versus those wishing to lay their trust in Nana Sahib's assurance. Wheeler, already in a poor state of mind, was actually in favour of holding out, but when some of his officers began to talk of the sense in escorting the surviving women and children to safety, the old general relented and offered to lay down his arms in return for safe passage. The next 24 hours saw an immediate improvement in the condition of the defenders. No longer having to brave the bombardment just to get a bucket of water meant that the defenders could drink their fill and wash and bathe for the first time in three weeks. Additionally, as the remaining rations would no longer be required for a long siege, allowances were doubled and the defenders could eat satisfying quantities for the first time in a long time. Probably most blissfully of all, the defenders could sleep without the din of cannons or the apprehension of an attack. With a day for preparation and laying to rest any remaining fallen comrades, the morning of the 27th June was designated as the day to board the boats to take them down the Ganges to Allahabad. A large column was formed with General Wheeler leading from the front. They tried to show as much dignity as they could muster but the privations and conditions were unable to be concealed from the Indian onlookers. The respect shown to the front of the column gradually broke down as looters and pilferers tried their luck in grabbing the personal effects of those further down the column. More locals swarmed into the entrenchment hoping to find things of value left behind by the defenders. Within an hour, the lead elements reached the embarkation point of Sati Chowra. One unanticipated problem was that the river was unusually dry and the boats were left fairly high and dry. It would take some serious dragging and effort to find the deeper parts of the Ganges. Nonetheless the hapless Europeans tried as best they could to find a place on one of the boats provided. General Wheeler and his party, being the first to arrive, were the first aboard and the first to manage to set their boat adrift. It was at this point that some of the mutineers began to look nervously at the general's boat floating downstream. It was clear that not all the boats were yet loaded and there were still a lot of Europeans waiting to board the at all. There was a bit of confusion as the Indian boatmen jumped overboard and made for the banks. They knocked over the cooking fires on the boats before jumping in, thus setting some of the boats ablaze. Then, all hell broke loose. Tatya Tope ordered the 2nd Bengal Cavalry unit and some artillery pieces to open fire on the hapless Europeans. The massacre was merciless. Bullets flew from all directions as the Europeans desperately attempted to scramble into the burning boats. There was no return fire as the British had been disarmed as part of the surrender terms. The relative shallowness of the river caused further difficulties in getting the boats moving as they scraped along the bottom of the riverbed. Bodies were falling everywhere as grapeshot and musket fire raked the boats from both banks. Mutineer cavalry sowars moved into the water to try and finish off any remaining Europeans with swords and pistols. Women and children were inevitably caught up in the deadly fire. Two boats seemed to drift off - General Wheeler's boat - which had started the mutineers in their murderous fire in the first place and a second boat which was quickly holed beneath the waterline with round shot fired from the bank. There was a panicked exodus from this second boat to try and attempt to make it General Wheeler's boat which was slowly drifting to safer waters. Meanwhile back at the boarding point, the carnage continued. It then stopped almost as suddenly as it started when the mutineers suddenly ceased fire. Any remaining women and children were taken prisoner and escorted to Savada House. Any remaining men were cut down where they stood. Approximately 120 women and children were thus taken away. The danger was not yet over for Wheeler's little ark with approximately sixty fugitives aboard. Mutineers pursued it down the riverbanks and the boat frequently grounded on unseen sandbanks. Trying to dislodge the boat under fire was particularly onerous to the remaining soldiers and officers on the boats. Not all were able to rejoin the boat whenever it floated free - General Wheeler's own family members were probably killed in the water trying to free the boat. The boat would be freed only to hit other sandbars further down the river. On one such sandbar with withering fire being provided by mutineers pursuing them along the banks, Lieutenant Thomson led a last gasp desperate charge out of the river into the mutineers. Unbelievably, the suicidal charge worked and in fact allowed them to capture some vital ammunition. The next morning yet another grounding resulted in another charge by Thomson and 11 volunteers. Yet again, the fighting was fierce. Thomson's party was forced to find a long way around the mutineers to get back to the boat, but when they got to where they expected to find it, they could not locate it. Whilst Thomson had been fighting, an attack had been launched from the opposite bank and the remaining defenders were on their last legs. After many of the remaining men had been shot or wounded, the remainder had decided to fly the white flag. They were unceremoniously escorted off the boat and taken back to Savada house. It was here that Nana Sahib ordered the execution of all the remaining men (including General Wheeler) whilst the women and children were taken to Savada House to be reunited with their remaining colleagues. Thomson's ordeal was not yet over. The survivors decided to run barefoot for three miles to try and evade any pursuing mutineers. Mutineers pursued but were wary of getting too close as Thomson's party laid several ambushes and mini-counter attacks. The party found some refuge in a small shrine. They blocked the doorway with the bodies of mutineers who had hastily charged the position. Appreciating the difficulties of a frontal assault, a group of mutineers went around the back and started digging from behind. Another group attempted to smoke the British out - but the wind took the smoke in the opposite direction. Gunpowder was added to the fire to thicken the fire later in the day. This prompted the British to try a last gasp charge through the thick black acrid smoke. Six of the British were cut down, but the rest managed to bayonet their way to the riverbank where they flung themselves into the river and tried to swim to safety. A group of villagers beckoned the five soldiers to their side of the bank only to start clubbing them as they reached that bank. One was killed leaving just the four - including Thomson - to swim to the centre of the river. They drifted downstream as best they could - although they now had to worry about crocodiles too. They came exhaustedly ashore a few hours later. Their fortunes finally turned for the better when they were discovered by Rajput matchlockmen who worked for the Raja Dirigibijah Singh who had remained loyal to the British. They were taken, or rather carried, to the Raja's palace. With the exception of Jonah Shepherd, these were the only male survivors of the ordeal. The dazed, shocked and confused women and children were moved from Savada House to the Bibighar. It was called this as in happier times a British officer had housed his Indian Bibi (mistress) in this villa-type house. It was terribly cramped for the women and children. The original 120 women and children would later be joined by other women and children from Wheeler's boat, some from a second flotilla from Fatehgarh (with three men) which had been captured and some other women and children who were already being held captive. In total there were about 200 souls crammed into the house. Nana Sahib placed the care for these survivors under one of his mistresses serving girls who would become known as the Begum. Her real name was Hussaini Khanum. She seemed particularly unmoved by the plight of her captives and did little to help them. Food was provided but little thought was given to the dignity or care of the prisoners. Nana Sahib had decided to use these prisoners as bargaining chips to try and keep back the relieving force of Havelock and Neill. They demanded that the British retreat to Allahabad. 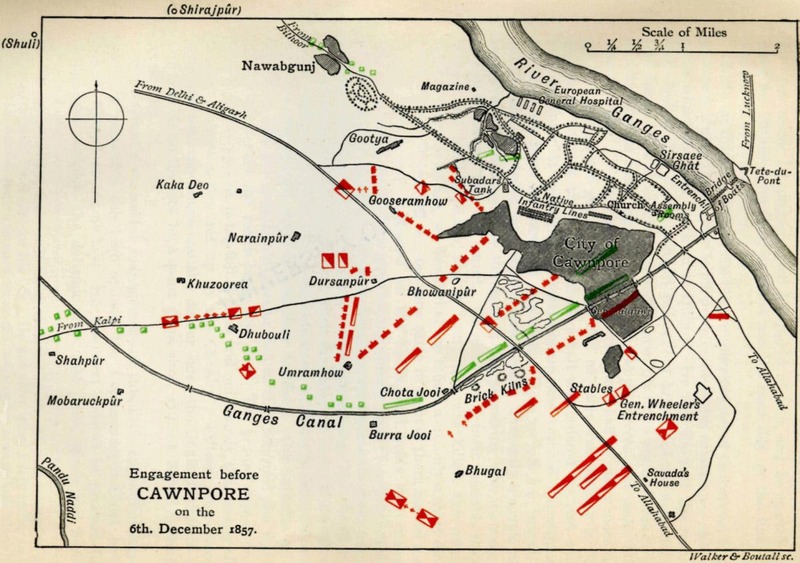 Havelock's force though advanced relentlessly towards Cawnpore. An army was sent by Nana Sahib to intercept the relatively small but determined flying column. They met at Fatehpur on July 12th where Havelock's forces quickly out-manoeuvred the larger mutineer force and captured the town. of 5,000 rebels with 8 artillery pieces awaiting them further up the road. Havelock decided that a frontal assault would be suicidal and so moved his infantry up on the flank whilst keeping his irregular cavalry in front of the mutineers as if they were still screening an infantry force. The plan was only partially successful as the mutineers spotted the flanking manoeuvre and opened fire. Desperate charges from the Highlanders carried the day but with high casualties on both sides. The road to Cawnpore had been cleared, but the cost of these victories had not yet been fully tallied. As it became clear that the British were going to enter Cawnpore, Nana Sahib, Tatya Tope and Azimullah Khan debated about what to do with their captives. As mutineers scurried out of the city, it was not clear how 200 women and children could be escorted anywhere and their use as bargaining chips had patently failed. Azimullah Khan was also worried that Nana Sahib might flee and abandon the mutiny altogether. The order was given to eliminate their prisoners. At first the guarding Sepoys refused to obey the order. They had executed the remaining men without much thought, but murdering women and children was another matter. It was only when Tatya Tope threatened to have the sepoys themselves executed for dereliction of duty that they agree to try and remove the women and children from the courtyard for their execution. The women had already realised what was going on with the execution of the remaining menfolk. They barricaded themselves in as best they could by tying the door handles with clothing. This did seem to work. The furore and screams were such that Nana Sahib left the building rather than be a witness to the enfolding massacre. Meanwhile, the sepoys moved to the opposite wall to the far verandah. Some twenty soldiers opened fire into the cramped compound. A second squad that was to fire the second volley was so disturbed by what they saw that they discharged their shots into the air and staggered away. The sepoys now adamantly refused to finish the job off. The Begum was so irate at what she called the cowardice of the sepoys that she had to get recruit her lover Sarvur Khan to finish the job off. He went into town and hired butchers with cleavers to finish off the nasty business. The remaining women and children were in such a sorry state that they found it impossible in their squalid, sickly state to fight off the cleavers of the strong, well built men finishing them off as a team. The murderers finally retired when it seemed as if the job had been completed, although remarkably some of the women and children had actually survived and lay for the night of the 15th amongst the scene of carnage. The following day, orders were given by Nana Sahib to clean up the scene of the massacre. They were surprised to come across the half dozen or so women and children who were still alive. The women actually threw themselves down the well rather than be murdered on the spot. 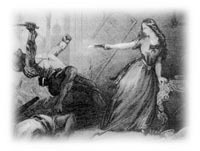 The children, who were only five and six years of age, tried to evade the scavengers and mutineers until exhausted. They were then chased around the corner into waiting executioners who decapitated them. Eventually, all the bodies were looted of whatever pitiful possesions that they still had on their bodies and were then dragged to the nearby well and thrown down it. The horror was indescribable. There was so much blood that they could not clean the walls and floors despite their attempts at scrubbing. On the 16th of July, a group of British officers and soldiers were directed by fearful local Indians to the Bibighar. They were horrified by the smell and sight that greeted them. They had assumed that they were arriving to rescue the women and children. Any feelings of elation at the victories and relief quickly turned to feelings of despair and then through to vengeance. It was beyond comprehension for Victorian soldiers to believe that innocent women and children could be butchered in such a manner. Most pitiful were the tiny hand and footprints of the children who had been slaughtered. Their tiny shoes brought tears to the eyes of the battle-hardened Highlanders and veterans of the 64th. Word soon got back to Havelock, Neill and all the remaining soldiers. Havelock actually had to worry about the large numbers of mutineers still in the area and he was also supposed to go on to Lucknow to relieve the force besieged there too. However, discipline had all but collapsed amongst the British who were in utter despair at the massacre. 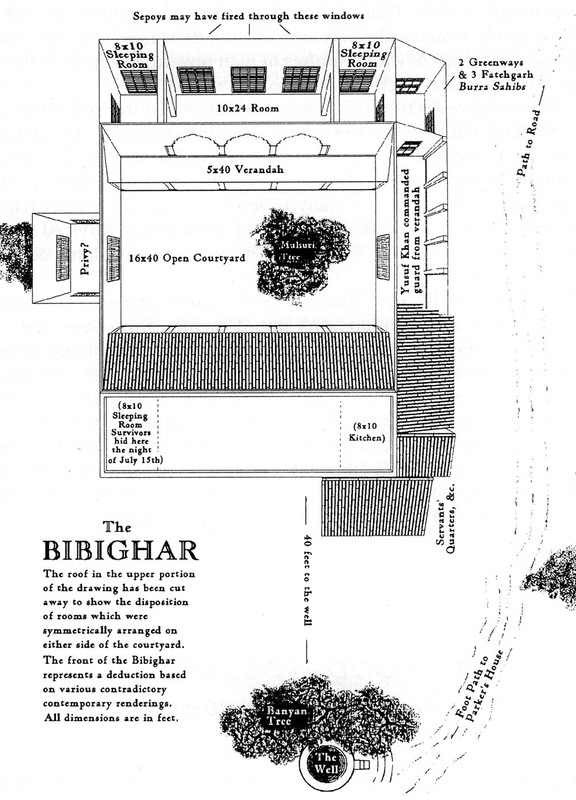 The Bibighar became a place of pilgramage for the British soldiers who then turned their indignation on any local Indians who happened to be in the way. They wondered how any of the locals could have let this massacre occur and do nothing to intervene and stop it. Neutrals became hostiles in the minds of the British soldiers. Looting, burning of houses and murder became acceptable as old testament-style vengeance was meted out indiscriminately. Looted alcohol fueled the despair and destruction. The worst vengeance was applied to any mutineer captured. No mercy was shown to them at all. A set of nooses was set up next to the well at the Bibighar, so that they could die within sight of the massacre. Colonel Neill decided that the crime was so serious, that all captured mutineers would be expected to clean up the scene of the massacre literally with their tongues. They were beaten and clubbed into licking the floor of the Bibighar compound. They would then be forced to eat Beef if Hindu or Pork if Muslim and then hanged at the gallows adjacent. 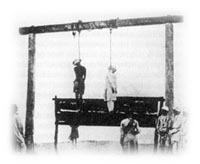 Sweepers were employed to execute high-caste Brahmins. Some Muslims were sown into pig skins before being hung. The idea was to ritually humiliate and defile the victims to preclude any reward they might have expected to find in the afterlife. Within days more bad news greeted Havelock with news that the commander of the Lucknow garrison had died and that that garrison was now seriously facing defeat. Havelock had to remotivate his tired and disconsolate soldiers and ferry them across the Ganges and go on the march again. Havelock's forces were motivated by thoughts of righteous indignation to destroy a mutineer force lying in wait at Unao and one at Bashiratgunj. News reached the British that the Gwalior army had joined the mutineers despite the attempt of the Raja of Gwalior to keep them loyal to the British. This meant that Havelock's exhausted and diseased force was perhaps not strong enough to fight its way through to Lucknow. Reluctantly he withdrew back to Cawnpore on August 13th to await reinforcements. When word reached Calcutta of the atrocities at Cawnpore, the political imperative to exact revenge became overwhelming. Europeans flooded to join the newly raised regiments and some of these were hastily despatched to attempt to avert any more massacres or disasters. Sir James Outram led such a force to the aid of Havelock. His small relieving force arrived in Cawnpore on September 5th. They then set out to force their way through the huge force besieging Lucknow. They were able to fight their way through to Lucknow, only to become besieged themselves! The manpower was helpful to the defenders, but escape was impossible. In fact, a second larger force under General Colin Campbell had had to be despatched. He had dropped off General Windham in Cawnpore en route to Lucknow. Windham, however, was over confident of his position and disobeyed Campbell's instructions by leaving his defensive positions and trying to engage a huge force of Gwalior soldiers and other mutineers being led by Tatya Tope. General Windham ordered a small advance on November 25th but did not press home his advantage, mainly due to his lack of numbers. Tatya Tope correctly interpreted that the British must be fairly weak and launched a sophisticated attack the following day. Tatya Tope had some 25,000 men plus eighty guns at his disposal. The British were outgunned, outmanned and outmanoeuvered. They began to flee back to the relative safety of a new fort that had been hastily thrown up over the last couple of weeks - directed by the remarkable Lieutenant - now Captain - Thomson no less. It seemed as if Cawnpore was about to be re-besieged! Street-fighting reignited but this time help was at hand. General Campbell had not dilly-dallied in Lucknow. When he had got there, he emptied the compound and got the garrison to come back to what was considered to be the relative safety of Cawnpore. They were surprised to come back to find it being besieged, but Campbell calmly took command of the situation. He engaged the mutineer artillery in a deadly duel across the river as Tatya Tope's men attempted to destroy the bridge of boats in vain. A 30 hour duel reduced the mutineer artillery and convinced the mutineers to retreat to give fight another day. Before going though they did set light to much of the city as a departing gift. Only now, on December 6th 1857, did the city of Cawnpore finally become pacified. Despite this, the women and children rescued from Lucknow were hastily sent down the river to the far more secure Allahabad. Cawnpore would finally return to its original job of being a significant military cantonment in a strategically important communications choke point. More expeditions would have to be sent out to try and bring Tatya Tope and other mutineers to heel, but Cawnpore itself would never be threatened again. June 13th / 14th Hospital destroyed, Assault staved off.